When you need to make cuts that are accurate, then you will need to find an ideal saw. 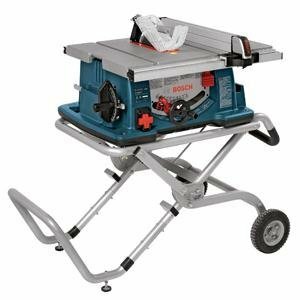 The Best Portable Jobsite Table Saw is one that is easy to carry from one job site to another. There are so many different types of saws, but you will agree that there are those that ideal best for making rip cuts. So as to find the best budget saw, that is portable, you will need to consider a whole lot of things and this seems to be tedious for most people. I have purposely put this guide together to look at the various top rated saw and also provide you with adequate information to help you pick the best value tool. There are many models on the market and this can be quite confusing, which is the main reason I will try to answer all the questions that you may have and help you get the best model for the money. The DEWALT DW745 is a preferred tool due to the compact size and design. The 10-inch saw is portable and can be used at different jobsites. While it may be small in size, it comes with amazing capabilities to ensure that you rip cutting tasks are not hindered in any way. There is a 15 amp motor with 3,850 RPM as the maximum speed and this gives you it the optimal power and maximum torque to make the desired cuts. The DEWALT 745 has all the accessories and components that you will require to make accurate cuts. You will get a blade guard, 24 tooth carbide tipped blade, push stick and miter gauge among others. The power that it exhibits is impressive and as such, you will love using it in your professional work or DIY woodwork projects. The 20 inch rip capacity will make it possible for you to work even on longer boards. If there is one thing that caught my eye with the DEWALT 10 table saw is the site pro modular guarding system, which makes it easier to position and adjust the fence to achieve accurate cuts. There is a 2 ½ dust collection port that can be connected to a standard vacuum cleaner when you need to extract the dust. The rack and pinion system also helps in the setting up. With a lightweight of 45 pounds, you will easily carry it around. The DEWALT DW745 is well protected by the still roll cage that it has, while the lock mechanism ensures that the saw is secured on the table. This is truly a portable model as it weighs 45 pounds. The DEWALT 10 has an advanced adjustment mechanism through the site pro modular guard system. This ensures that your cuts are accurate and on point. All the adjustments can be done by hand as they are tool-free. You will easily set up the tool and take down when you need to move to another jobsite. DEWALT 745 has a 15 amp motor that is quite powerful to give you clean cuts and it has a rip capacity of 20 inches. Ridgid R4516 is another remarkable model that can be convenient for a contractor who has to keep moving to different jobsites. The process of assembling it is fast and easy and does not need any tools. In addition, it is quite small in size and has a compact design, which means you can easily carry it in your trunk. It is also easy to use and all the features to facilitate rip cutting have been included in this tool. There is a retractable handle on the Ridgid portable table saw, which you will push away when you are not using it. This will give you more room to continue working and get better results. In addition, there is a hand wheel on the front side. This has been placed there conveniently to help you with blade height adjustments. This is a saw that has plenty of features to make your work easier at the job site. The site barrier system is another important feature of this best jobsite saw and this meant to restrain your focus to the cutting process. As a result, you will hardly make any mistakes and cannot be caught by the blade. You will also notice that the saw has a knob that is strategically placed. This is meant to trigger the blade into action and this is one of the easiest options to use as all the features are easy and straightforward. The Ridgid R4516 has a compact design and is smaller in size than most models. You can easily carry it around due to the lightweight of 63 pounds, making it truly portable. There is a knob that will come in handy when you need to adjust the height of the blade. This makes it safe since you will not have to touch the blade when adjusting it. There is also a hand wheel that is conveniently placed on the front of the Ridgid portable table saw, which will also be useful in blade adjustments. You are assured of your safety when you are working with it as it has a sight barrier system that allows you to keep your eyes on the blade as it cuts. The rack and pinion mechanism on the fence will make adjustments and align the stock to the blade easier on this best jobsite saw. If you are in search of a durable tool, then your answer lies in the Bosch 4100 09. As a matter of fact, any contractor that is looking for any tool needs to find a durable one that can withstand the frequent movement. The Smart Guard System adds to the juice of the advantages. This is a technology that will protect the blade and also help you when you need to guide your stock. With this model, you will only make accurate cuts. The sturdy base of the Bosch gravity rise saw is a big plus in that it will provide the necessary support when making cuts. This saw does not wobble or shake even when you have to cut through tough applications. There are handles that are placed on the stand, which makes movement much easier. It is made of high-quality aluminum and this means that you will have for a very long time. It also has a powder coat finish to enhance longevity. 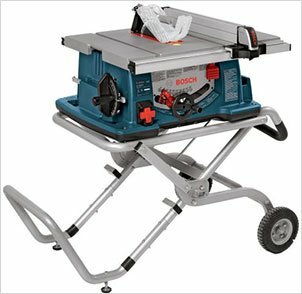 The Bosch 4100 09 table saw has a collapsible design and having been made of aluminum, you can be sure that it is light. The 8 inch treaded pneumatic wheels are large enough to help you move it in any terrain. The wheels are on the gravity rise stand, which is part of the creative innovation of this tool. You will certainly not go wrong with this one, in your projects. The Bosch 4100 09 has a very powerful motor that will spin at speeds of 3,659 rotations per minute. This gives it the power to cut through most applications. The rip capacity is 25 inches, which is higher than what saws are able to handle. The gravity rise stand on the Bosch gravity rise saw is fitted with 8-inch pneumatic wheels that are treaded. There are also handles on the stand to facilitate easy movement. The Smart Guard System and the SquareLock rip are some of the key features that will make it easier to make accurate cuts. Besides being light, the Bosch 4100 09 has a compact and collapsible design that will make easier to assemble and pull it down. The Ridgid ZRR4513 is a refurbished portable model. This means it has gone through significant improvements and this has made it become a model to reckon with. It is one that comes with a mobile stand and as such, you will be able to work with from one job site to another. The 10 inch saw comes with a 15 amp motor, which will power it enough to cut through any application at hand. You will love everything about this tool. There is a hand wheel that is included on the Ridgid portable table saw. This is another feature that grants the operator a whole lot of convenience when you need to adjust the blade. This handle is located on the front side of the tool. There is another unique feature referred to as a sight barrier, which serves as a safety feature as well as a mechanism to ensure that the accuracy of the cuts is not compromised. This is because the sight barrier forces you to stay focused on the blade as it cuts through your stock. This is one of the best options when it comes to a job site saw since it works with most of the accessories that work with many saws. There is also a knob that is used to trigger the blade into action and this also located on the saw. The retractable handle is also ideal since you can easily push out of the way to create more room to continue with the cutting process. There is an Ind-I-Cut alignment disk on the Ridgid ZRR4513 on a writeable surface. The saw also comes with a 15 amp motor, which is heavy duty and this is what gives you adequate power for various applications. 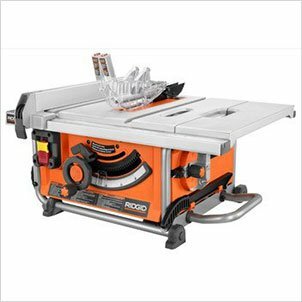 The Ridgid portable table saw comes with a Retract-A Rip system. This will extend the table surface and gives you a rip capacity of 25 inches. The internal rip fence will align and protect the fence when it is not in use. This will make it very easy to position your stock. The job site saw has a micro bevel adjustment and as such, you will make accurate measurements and make precise bevels. 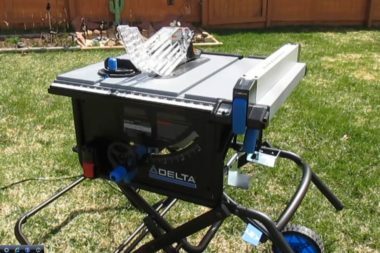 Delta portable tool is one of the models that you can use for DIY projects. It is portable and you will be able to move with it from one job site to another. This one comes with a stand that will support all the work that you will need to accomplish. You will have a number of accessories that come with it, like a miter gauge, 10 inch blade, blade guard and a push stick. The fact that the fence can slide out easily makes it easier to make adjustments for accurate cuts. The 15 amp motor is what makes the Delta 10 inch saw different from the other similar models. This is a powerful tool and quite strong as it is made of aluminum and steel. The saw is quite easy to use and comes with a friendly interface. There is an easy-access power switch, which serves as an emergency feature, a cord crap and other essential features. The folding mechanism of this makes it portable and is easy to transport and set up. There are transportation wheels on the Delta saw that is attached to the stand for mobility. Irrespective of the type of cuts that you need to make, you can be sure that this saw will deliver clean and smooth cuts. The appealing design is what makes is a preferred model for both professionals as well as hobbyists. There are so many features that this model carries, which makes it an ideal model for job site projects. 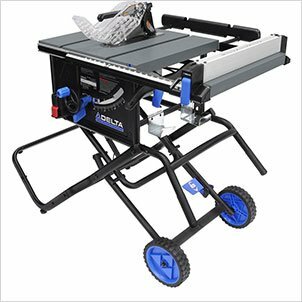 The Delta portable table saw comes with an aluminum top and steel parts, which makes it strong and durable. It also has an RH table extension, giving you more working surface. The large and easy to access on/off switch is an emergency switch in the event of an accident. This will shut down the machine in case something goes wrong. The Delta 10 inch saw has a fence and guard storage on the side, which will facilitate the smooth and accurate cuts. There is a cord wrap on the rear of the saw, which will keep the cord safe. The blade of the Delta saw can easily retract and goes below the surface when you need to clean up the table top. 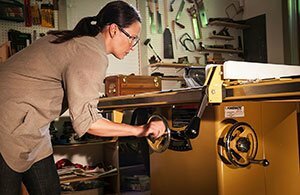 The best budget table saw will only be available when you have a budget in mind. There are so many models with different features and varied prices. Look for the models that are within your price range and this will help you to narrow down on the options that are available for you. Do not go for models that are very cheap as they may be of low quality. On the other hand, you need not buy very expensive ones. All you need is to find a good model, within your price range and one with features that appeal to you. 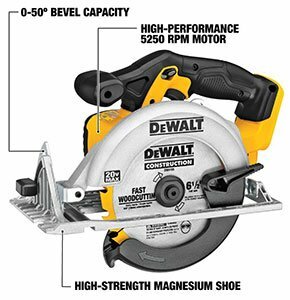 The best rated saw that can be used on jobsites should be mobile. As such, consider the features that have been fitted to facilitate movement. Some of the features that you can check include wheels and handles that are on the stand. If you will be using the best value table from one jobsite to another, you need a model that is easy to use. You do not need to waste a whole lot of time setting it up or even making adjustments. Some models are too complicated and this would not be the ideal choice for you. While the top rated table saws are commonly used in most places, they are also quite dangerous. As such, you need to check the safety features that it carries. It would be good to find a model with flesh detection, anti-kickback, emergency switch and so on. Never compromise on your safety when working with the tool. When working on different jobsites, you will need a reliable tool that can be used for various applications. As such, when you need the best model for the money, look for one with a powerful motor and one that can cut through different applications. Also look at the depth that it can cut. With these simple pointers, you will be able to find a good saw that will serve your needs. You should also consider various customer reviews so that you can have a feel of what to expect for a specific model. The surface that you are working on should always be clean. When there are so much debris and cutoffs in the working area, this may affect your visibility, causing you to make poor cuts or even causing injuries. The features are meant to serve a purpose. As such, you should always check all the features and confirm that they are working before starting it. Always wear protective clothing when operating the portable table saw. Some of the safety clothing include hearing protection, safety goggles, hard hats and so much more. This would be to prevent any accidents or incidents from happening. If you need to make any adjustments on the saw, you need to unplug it from the power. Failure to do so may result in turning on the power when you are working on it and suffer injuries. For any blade or any other internal adjustments, you should ensure that the blade has come to a complete stop. 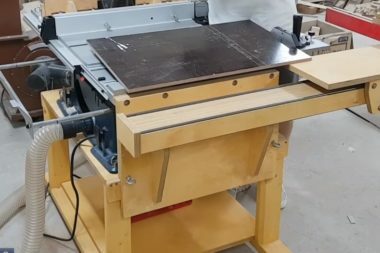 It is dangerous to attempt to touch the saw when the blade is still rotating. Never start the tool with the stock already engaged. What you need to do is start it and ensure that the blade is rotating to the maximum speed before you can commence the cutting. This is the only way cutting will be smooth and prevent any damage to the blade. Check the stock that you need to cut so that you can remove any objects that may cause kickback. Remove any wood knots, metals, nails, pins or any other foreign object on the stock. Kickbacks are the common cause of injuries in most cases. Whenever you are using your tool, you should stand at a good angle and maintain a good body posture. Do not stand directly in front of it as the stock can kick back and come directly at you. 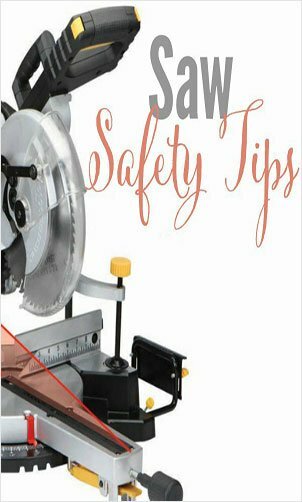 These are some basic safety tips for working with table saws. You should always be keen on your safety and refer to the owner’s manual so that you can use the tool in the right way. Q: Does the portable model work with stands? 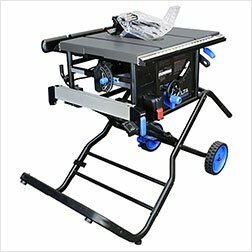 A: The best portable jobsite table saw will come with a stand, which gives you support when on your job site. Q: How often should I lubricate the aw? A: Most of them are usually lubricated. However, if you are to lubricate the moving parts use dry lubricants like silicone or graphite. Q: Which is the best safety feature? A: You should always go for the quality saw with as many safety features as possible. Some great features include anti-kickback and flash detection. Q: Are there specific blades for portable models? A: Each model has specifications from the manufacturer on the blade that it should use. As such, you need to follow the instructions from the manufacturer on the specific blades to use. Q: Is it okay to use an extension cord? A: There is no problem as long as the extension cord you want to use is in perfect condition. There are so many people who are interested in finding a good saw. 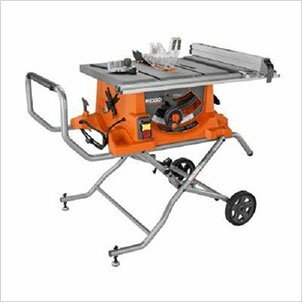 This is why I do my best to provide all the information that can help you in finding the portable job site table saw for the money. 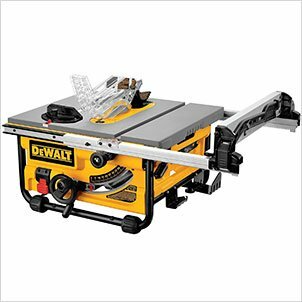 From the various models that I reviewed, I will go for the DEWALT DW745 10-Inch Compact Job-Site with 20-Inch Max Rip Capacity – 120V as the best portable jobsite table saw. This is a model that has so many features and will help you in your job site cutting tasks. This will be your resource to find the latest information on the portable models. You can always check to get up to date details. If this guide is of great use, please share it around with your friends and loved ones so that the can make the right choice on the best value saw.